Tuesday, January 18 | What Car? The What Car? Q&A session has now ended. Whether you're looking for advice on buying a new or used car, or have some other motoring-related issue that you'd like to try and resolve, our team of experts will be on hand to help out. Don't worry if you missed any of today's Q&A session, you can replay the entire session right here. Just click the box below. 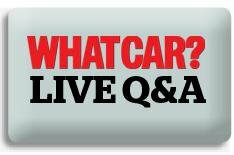 The whatcar.com Q&A is now in replay mode.